Looking for a New Ford Mustang in your area? CarGurus has 3,268 nationwide Ford Mustang dealers with 41,443 new car listings. With a nip here and a tuck there, plus substantial mechanical and technological improvements, the 2018 Ford Mustang aims to ensure its continued popularity. Ever heard the term “pony car”? It is a direct reference to the Ford Mustang and the American 2-door sports coupe segment it has dominated since 1964. Today, the 2018 Mustang is less rudimentary and more sophisticated than ever, blurring the demarcation lines between mainstream and premium cars, and muscle and sports cars. No longer are the Mustang’s primary competitors limited solely to the Chevrolet Camaro and Dodge Challenger, especially when measured in terms of performance. You are looking at a 2018 Ford Mustang GT Premium coupe with a price tag of $51,870. That’s Audi A5, BMW 4 Series, Infiniti Q60, and Mercedes-Benz C-Class territory, folks. Still, this Mustang remains a comparative bargain, because to come anywhere close to its performance capabilities with one of those luxury cars, you’re going to be spending tens of thousands of dollars more to get into an S5, an M4, a Red Sport 400, or an AMG C63. Sure, with the Ford you’ll settle for a downgrade in terms of interior materials, but the money saved can most certainly assuage any pain caused by the hard plastic digging into your left knee when you pitch a Mustang GT into a tight right-hand corner at well over twice the recommended speed. Thinking that a new 2018 Ford Mustang is for you? Well then, you’ve got some decisions to make. First, you’ll need to determine if you want a turbocharged 4-cylinder engine (EcoBoost), a V8 engine (GT), or an even more powerful and sophisticated V8 engine accompanied by a range of track-ready engineering upgrades (the Shelby GT350, which is considered a separate model). Second, decide if you want to shift your own gears or purchase a transmission that will do that for you. Third, select between 2-door coupe and 2-door convertible body styles, and if you want leather seats, prepare to upgrade into the Premium trim level. After that, you’ve got paint colors, wheel designs, and numerous performance, safety, and technology upgrades from which to choose. Prices start at $26,485 for a bone stock Mustang EcoBoost Coupe and rise to as high as $57,865 for a loaded GT Convertible. Unlike the EcoBoost and GT models, the wickedly fast and wickedly expensive Shelby GT350 is largely unchanged from last year and is priced from just over $58,000. 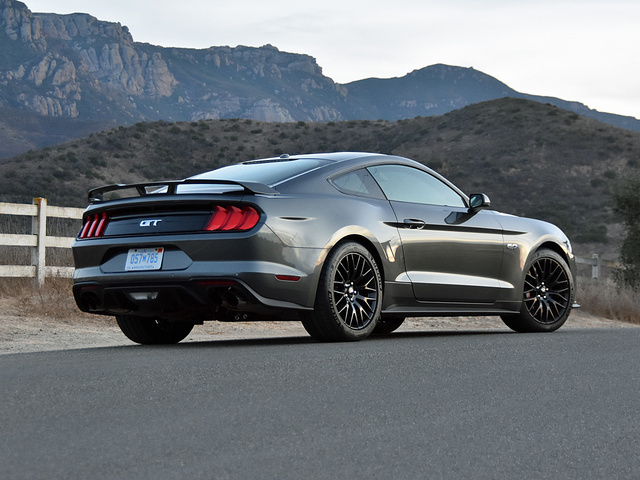 For this review, Ford provided a Mustang GT Premium Coupe dressed in Magnetic paint, fitted with the GT Performance Package, and equipped with the new 10-speed automatic transmission, the new Active Valve Performance Exhaust, and the new MagneRide adaptive damping suspension. With these upgrades and all the other equipment included here, my test car’s window sticker rose to nearly $52,000. Styling is updated for 2018, especially up front, where a lower nose and more aggressive face put visual distance between this car and last year’s model. In particular, I like the new hood and how it swells up and around the windshield to join the car’s beltline. Around back, last year’s weird body-color skid plate thingamabob is kicked to the curb in favor of a new diffuser panel between the exhaust outlets. Front and rear lighting is new, too, LED all around and retaining classic Mustang cues. Normally, I’m not a fan of dark wheels, but given the hardware upgrades that are also included with the Performance Package, I can live with them. Inside, the 2018 Mustang isn’t much different than before, but Premium trim equips the cabin with higher quality materials, exposed contrast stitching, and the aluminum carbon-pattern trim (Performance Package) to improve the ambiance. I’m also a fan of the new digital instrumentation option. Despite the interior upgrades, there remain a few questionable bits and pieces of plastic that are tough to justify given the test car’s price tag. With that said, what you’re paying for here is performance and heritage, and in these areas the Mustang over delivers. 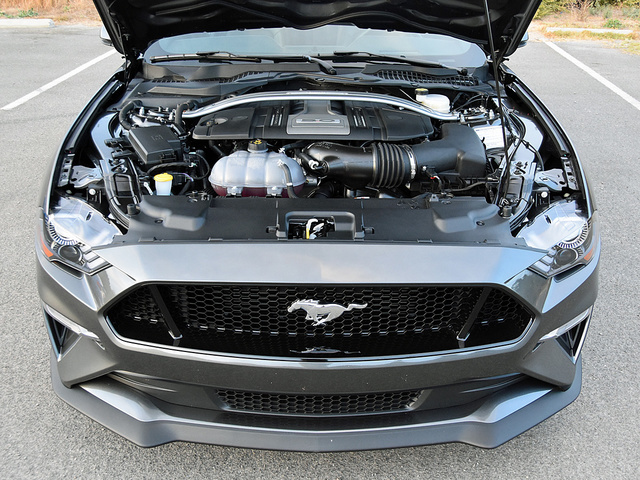 Ford has improved output for both of the Mustang’s engines this year, but for this review we’re going to focus on the 5.0-liter V8 engine that rumbles under the GT’s scalloped hood. Equipped with both direct and port fuel injection, the V8 makes 460 horsepower and 420 lb-ft of torque for 2018. A new 6-speed manual gearbox is standard, featuring a twin-disc clutch and dual-mass flywheel for improved clutch modulation. Most Mustang GT buyers will opt for the 10-speed automatic, which Ford co-developed with General Motors (so you can bet it will show up in the Camaro, too). That number of gears in a performance car sounds like a recipe for indecision and disaster, but Ford equips it with real-time adaptive shift algorithms, a direct downshift function, a skip-shift function, and paddle shifters in order to quiet concerns that the transmission will behave like a befuddled mess. Versions of the car equipped with a manual gearbox have a Launch Control function, and Ford adds a new Drag Strip driving mode to 2018 Mustangs equipped with the 10-speed automatic. With it engaged, the company says the EcoBoost version will accelerate to 60 mph in about 5 seconds, while the GT will achieve that velocity a second quicker. Drag Strip mode joins Normal, Sport, Track, Snow & Wet, and MyMode selections, each of which calibrates the car’s response in different ways. Finally, a newly optional Active Valve Performance Exhaust system debuts, featuring multiple settings that adjust the volume level of the racket emanating from the quad exhaust outlets. My favorite is Quiet mode, because I fail to see the point of attracting unwanted attention from law enforcement officers. It’s not like a Mustang GT is slower with it engaged. Plus, when I need to exit my neighborhood as the sun is just coming up over the horizon, I’m less likely to transform my neighbors into enemies. Nevertheless, Ford evidently recognizes that some Mustang owners have shortcomings for which they must compensate with a loud, obnoxious, and threatening exhaust note. Harley Davidson owners will just love the exhaust system’s Sport and even louder Track modes. Another new option for 2018 is an adaptive damping MagneRide suspension. Multiple settings adjust stiffness and compliance levels, so you can enjoy a relatively smooth, jostle-free ride on the highway and then switch to a rock-hard, roll-free setting for carving canyon roads. If you’re going to spend lots of time doing that, or taking a Mustang to weekend track events, I strongly encourage purchase of the Performance Package. It adds chassis, suspension, and steering upgrades, along with recalibrated antilock braking and stability control systems. Larger front brakes clamped by 6-piston Brembo calipers, a bigger radiator, and a Torsen locking rear differential are also along for the ride, and this version of the car is shod with summer performance tires wrapped around exclusive 19-inch wheels. So, with the stage set, how did my Mustang GT test car perform? In a word, brilliantly, and as a result, it may just match the Camaro SS 1LE for driving thrills. The Mustang feels smaller, stiffer, and tauter than before, like it shrank a size or two, and this in turn makes it far more tossable on tight, winding roads. Of course, a back-to-back drive on the same route is the only way to establish whether the Camaro or Mustang is actually better, and that’s not the point of this review. What I will say, though, is that a 2018 Mustang GT packaged like my test car is absolutely thrilling to drive. Even with the exhaust set to Quiet mode, it is loud and obnoxious when you really get into the throttle. Speed is effortless. The MagneRide suspension is perfection, and worth the upgrade if you need something that isn’t bone-jarring for daily driving. The brakes are indefatigable, withstanding significant abuse and suffering zero fade. Steering is better than that of any Mustang to come before it, proving quick, precise, and accurate. And handling with the Performance Package is ungodly good, the new Michelin Pilot Sport 4 S performance tires sticking like controversy on President Trump. I would, however, likely stick with the manual transmission. In my opinion, and despite its clear level of sophistication, the 10-speed automatic isn’t ideal in some situations. During my driving, it occasionally freewheeled when setting up for corners, and then just about the same time I’d stab the brakes harder to account for the lack of expected engine braking, it would downshift and the car would jerk a bit. It’s tough to drive a car smoothly when this is happening, and especially when it happens in an unpredictable manner. Employing the shifter paddles effectively eliminated this behavior, though, and it was far less likely to occur with the car in Sport mode. Ford also strove to improve the Mustang GT’s fuel economy with this 2018 freshening. 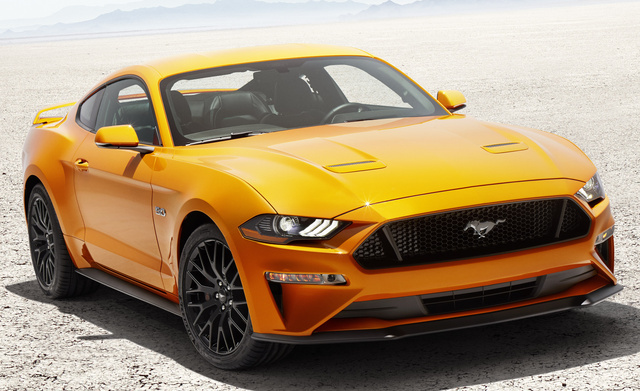 Thanks to the car’s slipperier aerodynamics and the 10-speed automatic, the EPA rates the V8-powered GT to return 19 miles per gallon in combined driving. I averaged 18.6 mpg on my test loop, driving hard for a portion of it, using the paddle shifters, and cycling through the car’s various driving modes. Based on this experience, it appears that the EPA estimates are accurate. Clearly, Ford made a big investment in the 2018 Mustang. And the end result is impressive. 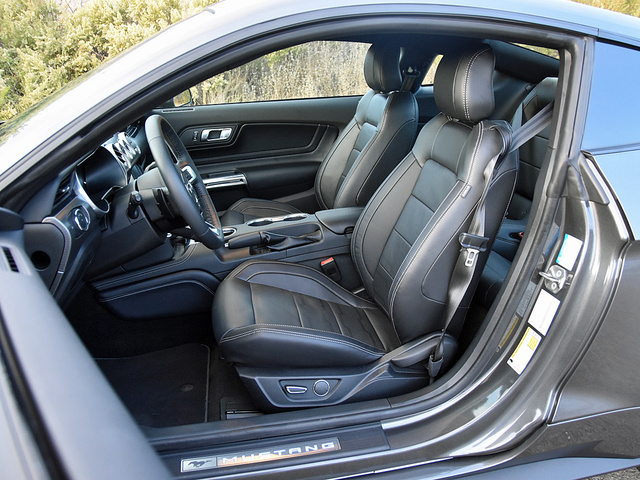 When equipped with Premium trim, the Mustang gets a significant upgrade in terms of interior materials. Every spot you’re likely to touch or even brace a leg is softly padded, with a single, glaring exception: The hard plastic on the door panel still digs into my knee in fast right-handers. Ford overlays the retro-themed dashboard with modern technology. The end result is pleasing, even if some of the materials are not. Ergonomics take a back seat to style in some cases, such as the hazard flashers that are activated using one of the lookalike chrome toggle switches just forward of the shifter, or the odd dials that control the dual-zone climate system’s temperature settings and flank a jumbled mess of buttons. Nevertheless, the 2018 Mustang’s cabin is a better place to spend time than ever. You’re going to want to be seated behind the optionally heated steering wheel or in the front passenger's seat, though, snuggled into the significantly bolstered chairs. 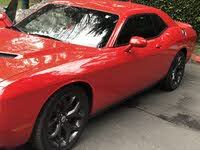 If you need an American sports coupe that can carry people in the back seat, get a Dodge Challenger. 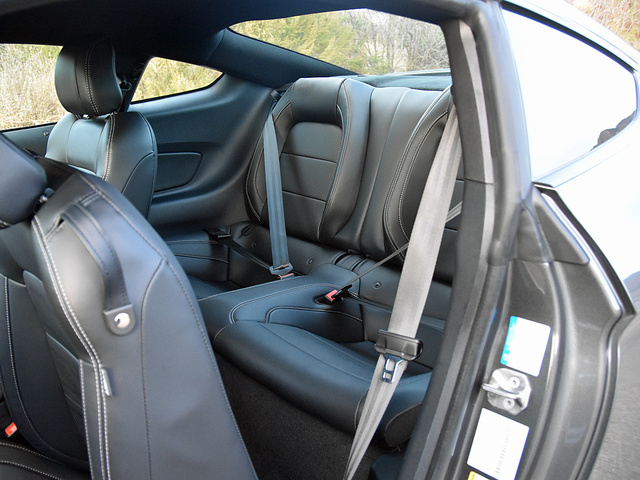 The Mustang is better than a Camaro in terms of rear seat room, but only slightly. Where the Ford improves upon the Chevy is that its airy greenhouse helps limit claustrophobia, which is a real problem in the Camaro. Entry and exit, even for kids, is difficult, and my first-grader had trouble getting buckled up due to her booster seat’s relationship to the deeply dished seat cushion and seatbelt anchor. Just as the car is best used for two people, so is the 13.5-cubic-foot trunk. You can easily load a couple of full-size suitcases into it, if you’ve packed light or you’ve got muscular arms and a strong back for tackling the significant liftover height. My wife used the car for a sizable Costco run and wasn’t grousing about a lack of space when she got home. Interior storage space, however, is limited. If what you’re bringing along for the ride won’t fit into the thin door-panel bins, shallow center-console bin, decent glove box, or average cup holders, you’ll need to toss it onto the rear seat. While the new 12-inch digital instrument cluster isn’t as visually compelling as, say, Audi's Virtual Cockpit, it adds a gee-whiz-bang element to the Mustang’s retro interior. The display changes depending on the driving mode, and in both Track and Drag Strip modes is clearly capable of delivering critical data with no more than a quick glance down. Speaking of performance driving, Track Apps returns for 2018, providing key performance metrics via the Sync 3 infotainment system. From design, user-experience, speed, and feature count perspectives, Sync 3 meets all modern standards for an infotainment system. Volume and tuning knobs are appreciated, and the Mute button is easy to access. The voice-recognition software, like so many such systems, causes occasional aggravation. Also, if you’re in Sport mode, the stiffer suspension makes stabbing a finger on the desired virtual button somewhat challenging. Ford Sync Connect is new for 2018, giving you remote access to certain vehicle features from a FordPass smartphone app. Apple CarPlay and Android Auto are also available this year, as is a 4G LTE Wi-Fi hotspot. The 12-speaker, 390-watt Shaker Pro audio system is fine, but nothing to get excited about. The 2018 Mustang can damn near drive itself. With this year’s update, it has adaptive cruise control, forward-collision warning with pedestrian detection, automatic emergency braking, and a lane-keeping assist system. A new driver monitoring system keeps tabs on you, too, suggesting a break if it determines that you’re drowsy or distracted. Blind-spot monitoring and rear cross-traffic alerts return from last year. Most of these features are configurable for sensitivity through the Mustang’s driver information system, and they’re calibrated for performance driving, too, issuing no untoward or inaccurate warnings when driving the car hard and fast. The lane-keeping assist system, however, significantly detracts from driving enjoyment. Don’t worry. You can shut it off. Crash-test ratings are good, if not great. The Insurance Institute for Highway Safety (IIHS) assigns it an Acceptable rather than Good rating for small-overlap frontal-impact protection, but the car does earn Good ratings in other crash-test assessments. The IIHS hadn’t sampled a Mustang with the new driver assistance technologies as this review was written. Meanwhile, the federal government hasn’t rated the 2018 Mustang at all, other than to give it a 5-star rating for rollover resistance. 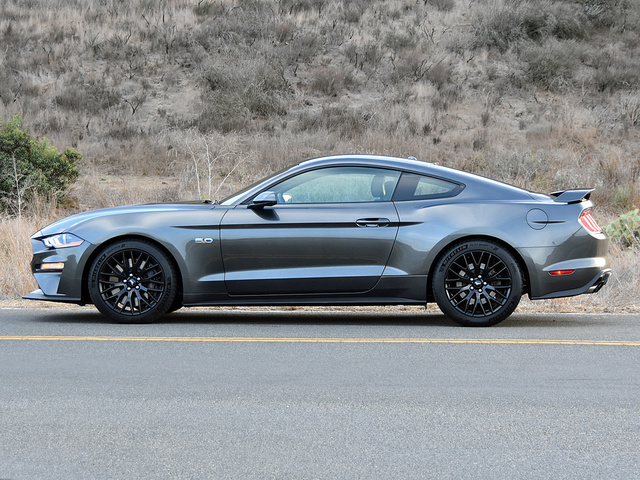 I started this review by sharing the sky-high price of my test car, comparing it to luxury-brand performance coupes, and then asserting that even at almost $52,000, there is value in a Ford Mustang. And I stand by that assertion. You can’t touch the Mustang GT’s performance at that price unless you get a Camaro SS or Challenger 392. If you can live without V8 power and all the extras on my test vehicle, you could buy a Mustang EcoBoost Coupe with a Performance Package for $28,980. Sure, you’ll get to 60 mph a second or two later than the GT driver in the next lane, but you’ll have just as much fun while flinging it down a favorite mountain road, and it comes with nearly as much visual attitude if not the same fire-breathing exhaust roar. Therefore, as wonderful as the Mustang GT is to drive, the real value is found in the Mustang EcoBoost. What's your take on the 2018 Ford Mustang? Rick I have a 2014 V6 Mustang that I plan to keep a little longer. When I can afford a V8, maybe I will get one. A 4 banger in a Mustang doesn't seem right to me, especially when the Focus that uses that same 2.3 Liter Engine is faster and posting better numbers. My V6 is slightly modded and plenty fast. Unsure why Ford didn't opt for a Turbo 6 in place of the Turbo 4. My only guess is that they felt it would take away from the V8. Peter I've just had the pleasure of spending four days with a 2018 GT and I loved it at all speeds; be that a low-speed burble or at high-speed. I never turned on the stereo because the car made it's own music. If you don't understand that, buy something else. 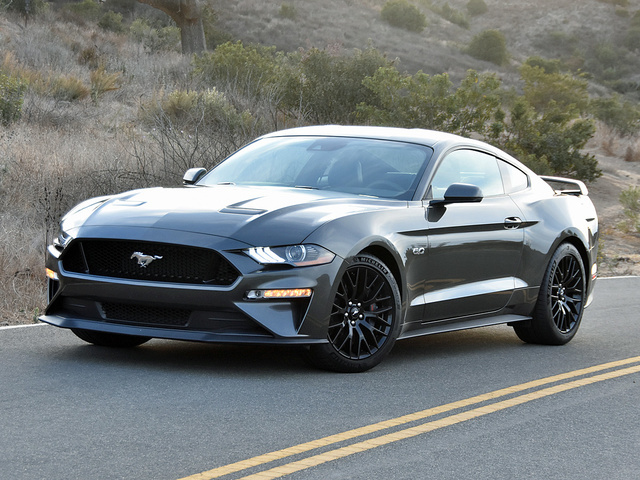 Users ranked 2018 Ford Mustang against other cars which they drove/owned. Each ranking was based on 9 categories. Here is the summary of top rankings. Have you driven a 2018 Ford Mustang? Enter your zip to see incentives for a new Mustang in your area. I want to buy this mustang but its currently under lemon law with hesitation of acceleration? What are your thoughts on this? Is it worth buying ?